The depth and breadth of their hit singles, best-selling albums, and sold-out concerts tell of this band's enduring power. Chicago – The Band is at it again — taking on an extensive tour de force in various key cities in the US. 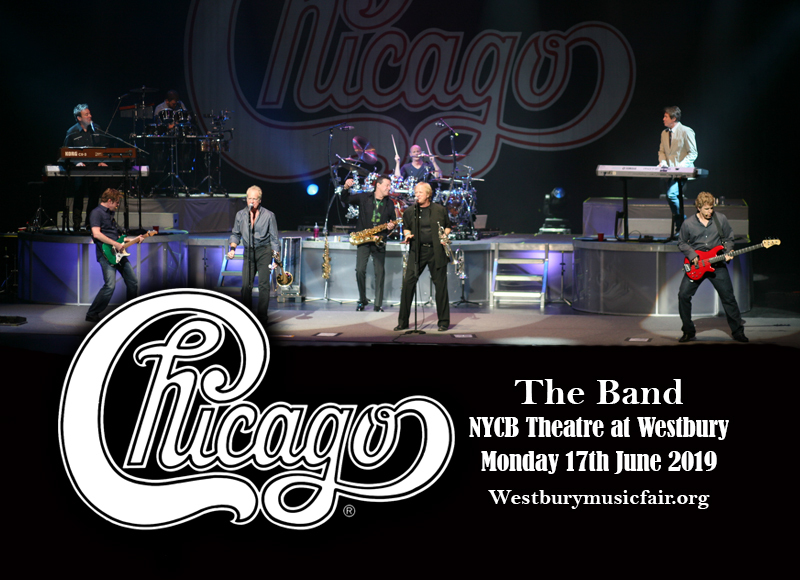 They are set to fill the halls of the NYCB Theatre Westbury with their timeless classics, on Monday 17th June 2019. Be part of this event that is bound to turn into a massive sing-along party. Their devoted fans never fail to show up in their concerts time and time again, and friends, family, and loved ones tag along as well. Booking tickets here is easy with a click, yet waste no time in leaving this opportunity 'til tomorrow. This is a hot-selling ticket and it's best to book it right here, right now! Chicago is a well-known all-American band with a genre that throws in a little bit of everything ranging the gamut of rock, pop, and jazz. Their rather unique styling is loosely described as 'rock music with horns. They initially began as a cover band in 1967, comprised of original members Peter Cetera on vocals and bass, Terry Kath on vocals and guitar, Robert Lamm on vocals and keyboards, Lee Loughnane on trumpet, James Pankow on trombone, Walter Parazaider on sax and Danny Seraphine on drums. They progressed to composing original songs and soon became prolific songwriters. Their debut album released in the 70s became a catalyst for an unbroken chain of hits to the 80s and beyond. Tinges of jazz influence reflected more on their early hits which include "Saturday In The Park", "Colour My World", and more. Towards the 80s, they leaned on coming up with rock ballads that propelled them on to heights of mainstream success. "If You Leave Me Know", "Hard Habit To Break", "You're the Inspiration", are just some of their mammoth radio airplay and chart-topping hits that defined the killer ballad era of the 80s and on to the 90s. But these songs are still very much alive on the airwaves. This attests the iconic and influential status that Chicago has established and cemented in the history of pop-rock music.